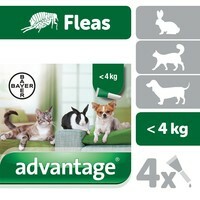 Advantage 40 Flea Treatment should be used for smaller cats, small dogs and rabbits. Each pipette contains 0.4 ml (40 mg imidacloprid) and 0.1% butylated hydroxytoluene (E321) as a preservative. Indicated for the prevention and control treatment of flea infestations and can be used on kittens aged 8 weeks and older. If your rabbit or cat is over 4 Kg please use Advantage Large Cats, if your dog is over 4Kg please use Advantage for Dogs. Treatment should be applied topically every month. Advantage 40 for Small Cats, Small Dogs and Rabbits contains 4 applications providing 4 months protection. Always been under the illusion that front line was the best none prescription flea product out there but it didnt work well on my cats. Noticed fleas (indoor cats) hoovered and sprayed the house and ordered advantage was amazed how quick it worked within a couple of hours instant relief of itching for the cats will continue to treat the house also but so far brilliant product. This product is excellent and noticeable within 2 days of treating the pets. And the other "Advantage" is that, there are no side effects. Have bought and used this product in the past. So much more effective than Front line. Have even recommended to friends who've bought it and were pleased with results. No fleas, no itchy cats and no bites on me! I was using Frontline in the past but could not get on top of the flea problem with my 3 cats and 1 dog. I heard that there was some resistance in fleas to the active product in Frontline so changed to Advantage which has a different active product and - it really got rid of the problem - no fleas since then. I use Advantage every month all year round and so far so good! love the fact i can save money getting them this way and it works perfectly for my cat certainly no fleas here. I could not be more satisfied with your company and your service. Reliable, fast and efficient and competitive on pricing. Excellent website. I can't praise this product enough!brilliant,so easy to administer and works very well too! The fipronil based drops I have been using (with great success) stopped working and my cat developed an allergy to the flea bites. She was in a mess. Thankfully these drops work really well and her fur is almost all grown back ! Great product for my cat. Works well and I have had no problems with it so far. Great product. Works fast and stays effective! Seems to stop any reoccurrence too. I have just one house bunny (lion-head) she doesn't mingle with any other animal, but we still had bouts of fleas/mites etc - it's assumed by the vet that they simply come in on hay purchased. I combine this with the Xeno 450. I alternate between them, one month she'll get this spotted on her neck to prevent fleas, the other month the Xeno 450 to prevent any sort of mite, and since I've been using them together for about 2 years now we've had absolutely no problems. Good value for money for my bunny as she only needs one pipette a month. I had used so many other products with no joy, so I bought this in a last ditch attempt to get rid of the fleas that my indoor cat had. Within 5ish hours of application to my delight, dead and dying fleas were literally falling off my cat. I can't describe how happy I am with this product as I have gone through so much grief to get rid of the fleas and finally something has worked. Fantastic product and at a great price which is less than half the price of the same product is other leading pet stores. I always used to use Stronghold on my cats until it had no effect whatsoever on the fleas. I shopped around for a different formula and read the glowing reviews of Advantage, so I decided to give it a try. Fleas hate this stuff and you'll find several dead fleas where your cat has been sleeping after the first day of application. Additionally, this stuff doesn't smell quite so bad as other spot-ons and so I was able to stealthily administer it to a drowsy cat without the smell bothering her so much that she wanted to get up and hide! Great product works well and great if you buy on the multi buy, saves you a bit of money. Have been using Frontline Plus for years, hoovering, washing bedding at 60 degrees and still having problems. Finally decided to switch and I wish I had earlier. For the first time ever I am finding dead and dying fleas on my cat bedding. Hoping that combining with Indorex I will finally get on top of this problem. This product works. Frontline has been somewhat ineffective and the recent hot weather has compounded problems. Within hours I found fleas dead and dying on the tiled floor. Cat has stopped scratching and pulling out her fur and hope to see a marked improvement in her coat and condition soon as she looks quite scruffy at the moment. I have two cat's & a dog, the cat's contracted fleas from the wildlife they are always catching & from the feilds where we live. The fleas got passed on to my Bichon Frise who never had a flea until we had the cat's, they were all infested with them I was picking fleas off my dog every day & he was always scratching & biting himself, bathing helped a bit infact I tried a lot of treatments but to no avail. I decided to try Advantage on both cats & dog & it worked almost straight away, they are all flea free now I also gave them a Capstar tablet at the same time to rid them properly which has done the trick. I will be treating them every month to keep the little horrors at bay...Thankyou VetUK I will be ordering again very soon. I'd been using another leading brand of fleakiller but my dog (a cavalier king charles spaniel) had an allergic reaction to it, and was virtually bald on his back end because it was causing him to bite himself constantly, so I was recommended to use this one and I haven't looked back since. It's brilliant! Had been using frontline for 6 years until my cat suddenly got fleas - panic! but was recommended this by the cattery we use and after one dose the fleas were gone (and not returned) would also add that my cat has sensitive skin but hasn't had an adverse reaction. We had an unexpected flea infestation and have 17 rabbits that were affected and we only needed three applications of this (as it only works for one week on rabbits) and two applications of the acclaim house flea spray and the problem was sorted - that was five months ago and we've seen nothing since - great stuff! This is the first time that I have used Advantage Flea Treatment for my cats. I am using it as a preventitive measure, however, I use it on recommendation from my mother. She has two cats, who had a recurrent infestation of fleas in spite of being treated by Frontline. After doing a little research we discovered that there is a rising issue with fleas being resistant to Frontline. Advantage being a different insecticide to the one in Frontline, encouraged us to try it. My mother's cats are flea free from the first application which is the first time in 6 months. I have used it on my kitten and have seen no adverse reactions and definitely no fleas. Would definitely recommend. Fantastic product great prices would recommend advantage to treat your animals in the war against the little critters we know as fleas! I recently swapped to advantage as my usual treatment seemed to have stopped working, but this has definitely blasted the little critters. Another advantage (if you'll pardon the pun) is that unlike some other treatments, the fleas don't need to bite the cat for it to kill them, so it is also better for cat flea allergy sufferers like my little fluffster. Definitely recommended. This was recommended by my vet when Effie was a kitten and I have stuck with it ever since, she is almost 2 now and never had fleas. I will continue to buy it from vetuk now as it is a great price on here compared to my vets! I buy this for my cats, and also being a dog groomer I use it when needed on any dogs I might be grooming. It is effective and excellent value for money. This product is terrific value for money as it has the same active ingredients as the one I bought from the vet but for a lot less money. It is working well as I haven't seen any fleas on my cat or seen tell tale scratching since I started using it. My only reason for not giving it 5 stars is that you can't see when the vial is empty. The Advantage keeps my 3 cats free of flies. though they are indoor cats. They spend time in a summer house. So these pipettes protect them.